WOODBRIDGE – Woodbridge Mayor John McCormac and Housing and Mortgage Finance Agency (HMFA) Executive Director Marge Della Vecchia joined Department of Community Affairs’ (DCA) Commissioner Joseph Doria last week at 239 Wall Street, a 3-bedroom home in the Menlo Park Terrace neighborhood, to announce that Woodbridge is the newest member of the Live Where You Work Program. Woodbridge is the 3rd municipality to partner with HMFA on the program. The Live Where You Work Program is a work force housing initiative that provides low-interest mortgage loans to homebuyers purchasing homes in towns where they are employed. Other benefits include down payment and closing cost assistance for the purchase of a home within Smart Growth Areas and flexible underwriting criteria for the loan qualification process. Homes must be located in a municipality that has become a Live Where You Work partner with HMFA. The Live Where You Work initiative further enhances Governor Corzine’s efforts to revitalize and build sustainable communities that will provide a greener environment, access to transportation and affordable housing opportunities for residents. As a result of this partnership, people working in Woodbridge who are interested in buying a home in the Township will be able to take advantage of the Live Where You Work program incentives. Live Where You Work is administered by the HMFA, a DCA affiliate. To learn about how to get a Live Where You Work mortgage, please call 1-800-NJHOUSE. For more information about how municipalities can join Live Where You Work, call 609-278-7478. Or, you can visit the Live Where You Work website at www.livewhereyouwork.nj.gov. 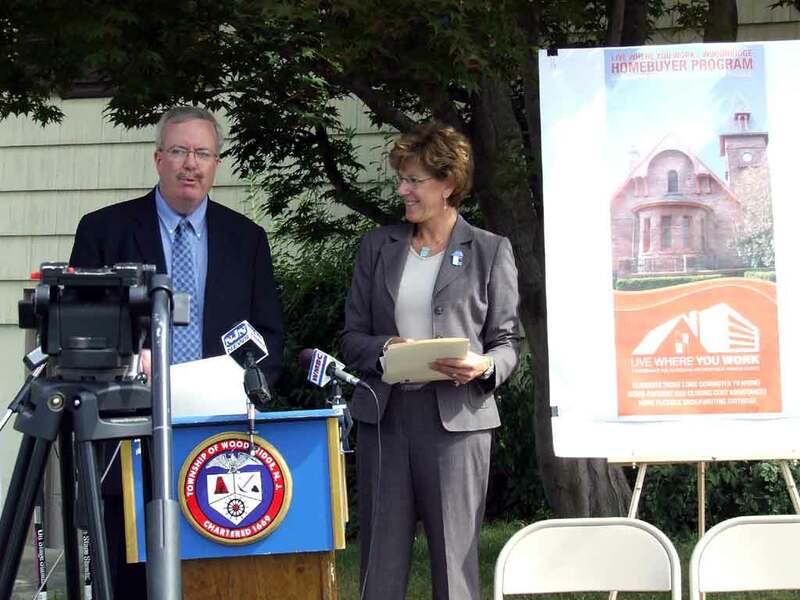 Woodbridge Mayor John E. McCormac and Marge Della Vecchia, executive director, New Jersey Housing and Mortgage Finance Agency, announce details of the “Live Where You Work” program which offers low-interest mortgage loans to homebuyers purchasing homes in towns where they are employed. “Live Where You Work” encourages Woodbridge Township families, first-time home buyers and township workers to invest their home buying dollars in purchasing a home in Woodbridge Township.